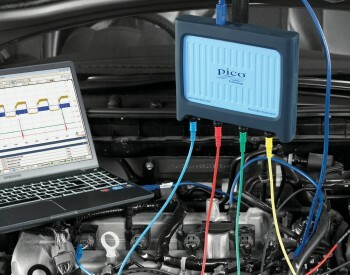 Pico Technology’s PicoScope oscilloscope turns any PC into a useful and powerful piece of diagnostic equipment, suitable for finding a host of electrical and operational problems on cars, motorcycles, and other vehicles. Basically, it shows in visual form the changing signals inside vehicles wiring. PicoScope units are available on their own, but most customers prefer to buy a complete kit that includes all sorts of adapters for accessing relevant signals – all in one box! These money-saving kits are used by automobile manufacturers and technicians all over the world – and they hold in one place everything needed (except the PC!). 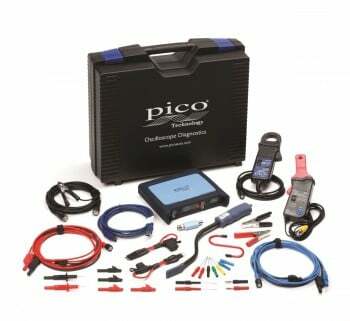 In fact, the PicoScope is the world's leading product choice for vehicle manufacturers and automobile technicians. But please note that it is not used for indicating a vehicle’s OBD II codes. Do I Need a Scan Tool or an Oscilloscope? In reality, both are needed for complete vehicle diagnostics work. Scan tools can often give the right direction for problem identification, e.g. a misfire on one cylinder, but less seasoned technicians may then needlessly replace several parts before the problem can be eliminated. remove guesswork by focusing on individual components before replacement. This avoids guesswork, replacing numbers of parts until the fault disappears. find charging and starting problems better. find mechanical problems (e.g. compression or slipped /badly fitted timing belts. 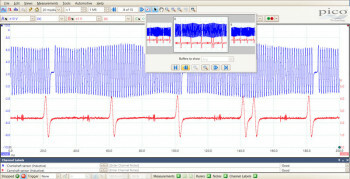 Oscilloscopes lead to faster, more efficient troubleshooting, plus a better comprehension of vehicle system operation. Use of a PicoScope encourages a "fix it correctly" atmosphere in a workshop - reducing the number of “guesswork” replacements. This means increased customer satisfaction, more repeat business, and bigger profits. Everyone wins - and it pays for itself in no time! 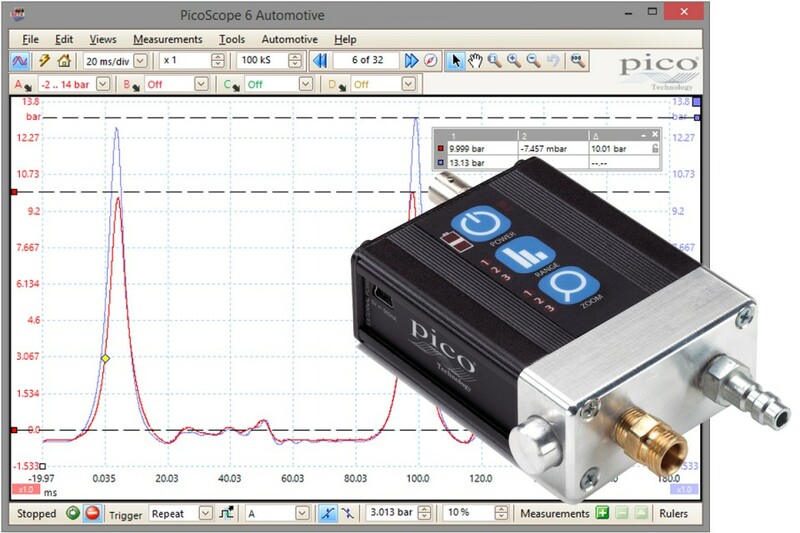 PicoScope 6 Software (provided free) is a very advanced automotive oscilloscope software package, yet it is easy to use and gets results quickly. There are also plenty of videos to watch online to get you up-and-running quickly. This software is designed to get to the root of the problem – fast! Features that have been included (e.g. auto setup, tutorials and guided tests) help in quickly getting new users comfortable with the equipment. Advanced features (e.g. math channels, waveform buffers, advanced triggers, reference waveforms, etc.) mean that an experienced user will never run out of powerful diagnostic help. With Picoscope software there are no knobs or dials to worry about. This leaves more area on the PC display for crisp, clear high resolution waveforms. 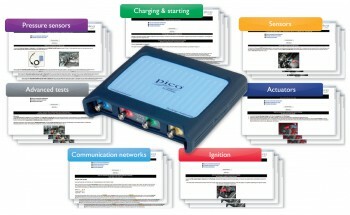 And PicoScope software has now become the industry standard - so is transferable, should you change jobs. Updates to the software are frequently released to include new features and tests, and these are free for the lifetime of the product. 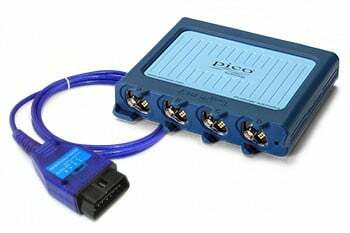 The two-channel PicoScope 4225 and four-channel PicoScope 4425 are more powerful than their predecessors and are powerful enough for future vehicles that feature new technologies such as CAN FD. Floating inputs allow measurement on ungrounded signals, and the “ConnectDetect” feature insures that your connections are good. These PicoScopes also feature USB 3.0 connection and power. Purchasing a diagnostic tool may not only cost money but also costs the time in learning how to use it. So with Picoscope products, the hardware and software has been specially designed so that it is easy to use for beginners, but has the power and features demanded by seasoned users. And there is no compromise on quality or specifications, so a PicoScope bought today will still be an essential diagnostic tool 10 years from now! More than 150 Guided Tests are built into the Picoscope software, from simple injector tests to more complex challenges like CAN bus testing. Selecting a Guided Test configures all the settings for you, and a reference waveform is loaded. Diagrams and photos show which leads and/or accessories are needed, clear vehicle connection instructions, as well as the actual test procedure. And when the test is completed there is help for understanding the resultant waveform, how the component works, and typical faults or fixes. As vehicle technology changes, Picoscope manufacturer Pico Technology releases additional tests through free uploadable software updates. The library included in the software CD enables you to share and store waveforms online and also search a global database of waveforms uploaded by PicoScope users worldwide. Powerful search capabilities let you find “known good” waveforms from the same vehicle types. Working with a slipped timing belt? Take a look at hundreds of comparison cam/crank waveforms. Crank current maybe too high? Download a waveform to compare. Compression test. Turning the engine quickly displays the relative compression of each cylinder. 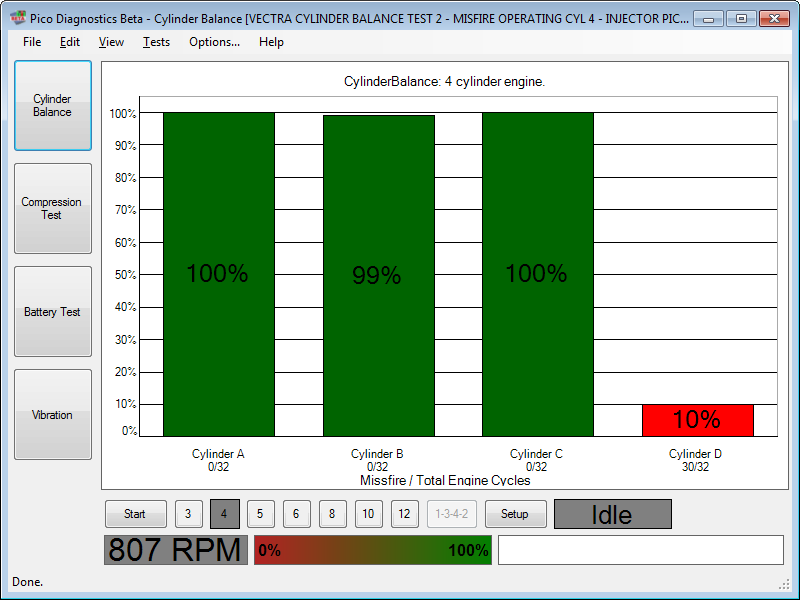 Cylinder balance / misfire detect. 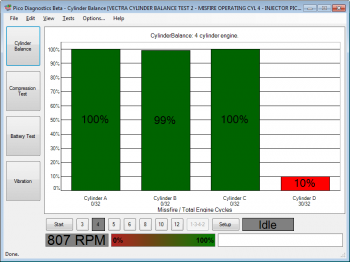 Compares the power output of each cylinder and indicates misfires. Battery test. Displays CCA, state of charge and voltage drop when starting. Pass / Fail. Alternator test. Measures charging voltage/current. Checks for excessive diode ripple. The WPS500X Pressure Sensor turns pressure readings into electrical signals, and the resulting waveforms can be viewed on the PC screen. In-cylinder waveforms show valve and timing issues, mechanical failures, blown gaskets, or blocked catalytic converters. Many other pressure sensors can only measure a limited range. This means that you would need different sensors for different tasks – inconvenient! But the Pico-designed WPS500X has three ranges in one sensor so it is flexible enough to work all over the vehicle - fuel pressure, transmission pressure, intake vacuum - even exhaust pressure waveforms. It comes as a complete kit with hoses (compression, fuel, vacuum, bleed) and adaptors (exhaust, M10/M12/M14 plugs and universal). Despite recent progress in vehicle damping and sound insulation, vibrations and noise are now diagnostic challenges. Much time can be wasted and parts swapped in solving customer complaints. 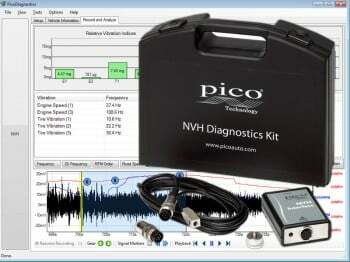 The NVH kit works with a PicoScope to quickly identify problems: the microphone can be used to find noise problems, or for vibration issues use the accelerometer in the kit. Picoscope’s sophisticated software quickly pinpoints the source of the problem. The kit can also be enhanced with additional accessories for on-vehicle driveline balancing.